Glaucoma associated with anomalies pose a challenge to treat and control intraocular pressure (IOP) specially in young individuals where the chances of failure are more. A well functioning bleb is essential for maintaining IOP and preventing progression post surgery. Encysted blebs though common, are difficult to treat. We present to you the histopathology of an encysted bleb in a case of a young glaucomatous patient in whom partially excising the bleb wall proved beneficial in maintaining the IOP thereafter. A 27-year-old male patient reported to our glaucoma clinic with complaints of blurring of vision in the left eye for few months. There was no history of pain or redness. No significant past medical or surgical history could be elicited. He had a family history of his mother being on medical treatment for open-angle glaucoma. On examination, his best corrected visual acuity in both eyes was 6/6 and N6. Intraocular pressure (IOP) measured using Goldmann's applanation tonometry was 22 mmHg and 40 mmHg in the right and left eyes, respectively. Slit lamp examination of the right eye showed a normal anterior segment. Examination of the left eye revealed a clear cornea, an iris anomaly with corectopia, peripheral anterior synechiae, and clear lens [Figure 1]. Gonioscopy showed the presence of the broad synechiae. Trabecular meshwork and part of scleral spur was visible in the upper nasal quadrant (about 100 degrees) [Figure 2]. Visual fields with automated perimetry Humphrey's field analyzer (24-2) were reliable and normal in both eyes. 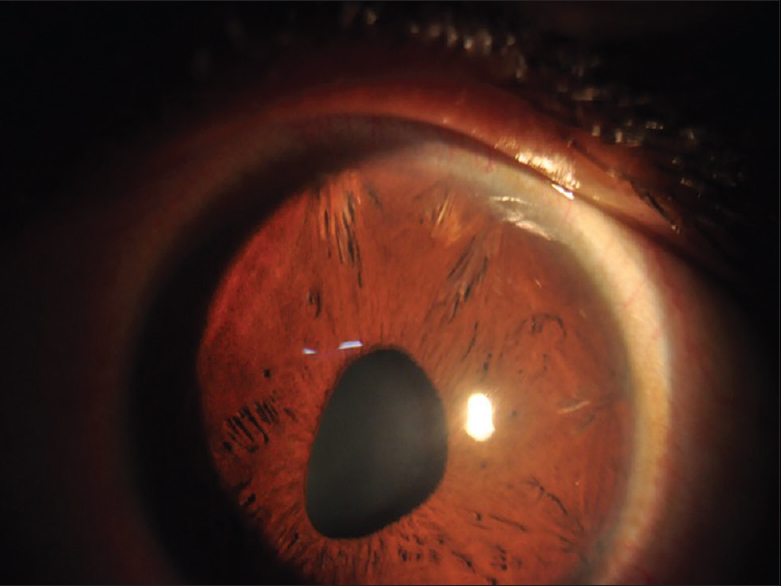 Fundus examination showed a picture of mild disc hyperemia with a cup-disc ratio of 0.3 in the left eye. He was diagnosed to have iridocorneal endothelial syndrome in the left eye. Herpetic etiology was ruled out as there were no other signs or symptoms pointing to this. The patient was prescribed topical brimonidine + timolol eye drops twice a day and oral Acetazolamide 250 mg twice a day. Two months later, as IOP remained uncontrolled at 28 mmHg, the patient underwent Trabeculectomy with Express implant in superonasal quadrant in the left eye. 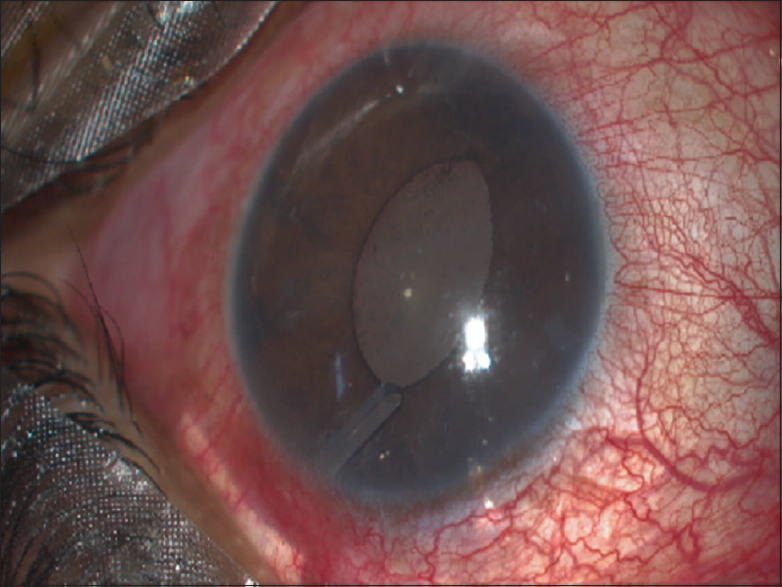 A peripheral iridectomy was not done as there was no pupillary block and the AC was well formed. No antimetabolite was given at this stage. A well-functioning bleb was formed and maintained for few weeks. On review after 1 week and 4 weeks, a good bleb was noted with IOP of 14–14 mmHg. A flat bleb was observed during the 6th month follow-up visit with IOP of 26 mmHg. Subconjunctival and subscleral bleb needling was done with a 26G needle without entering the AC, and a dose of 0.1 ml subconjunctival (SC) 5-Flourouracil (5-FU) (50 mg/ml) was given in inferior bulbar conjunctiva. IOP was found to be 14–16 mmHg during follow-up after a week. After 4 weeks, he presented with IOP of 43 mmhg (LE) and a flat bleb again. A second surgery was performed wherein a Glaucoma Drainage device (Ahmed Glaucoma Valve [AGV]-FP7) was placed superotemporally [Figure 3]. Postoperatively, he was on put tapering doses of topical prednisolone, oral acetazolamide 250 mg ½ BD, and moxifloxacin eye drops for 4 weeks. The bleb was found to be encysted during the 1 month follow-up visit for which sub-conjunctival bleb needling was done and 0.1 ml SC 5-FU was given. Six weeks later, he returned with IOP of 24 mmHg and a large encysted bleb [Figure 4]. He underwent surgical bleb wall excision and repair. Under peribulbar anesthesia a 5 mm gentle conjunctival peritomy was made over the large encysted bleb. The cyst wall was entered with a side port 15° stab knife and a square window of about 4 mm × 4 mm was made well away from the peritomy site, so the cyst wall window did not underlie the peritomy incision [Figure 5]. The peritomy incision was then closed watertight with continuous 8 0 vicryl suture. The cyst wall sample was sent for histopathological examination. The histopathological examination revealed multiple loculated cysts in the epithelium with an increased number of goblet cells in all the layers and a few areas of hemorrhage restricted to the superficial layers. Melanocytes were seen at the basal epithelium. Lymphoid layer showed loose connective tissue but showed no signs of inflammatory reaction such as macrophages, plasma cells, or polymorphonuclear cells. 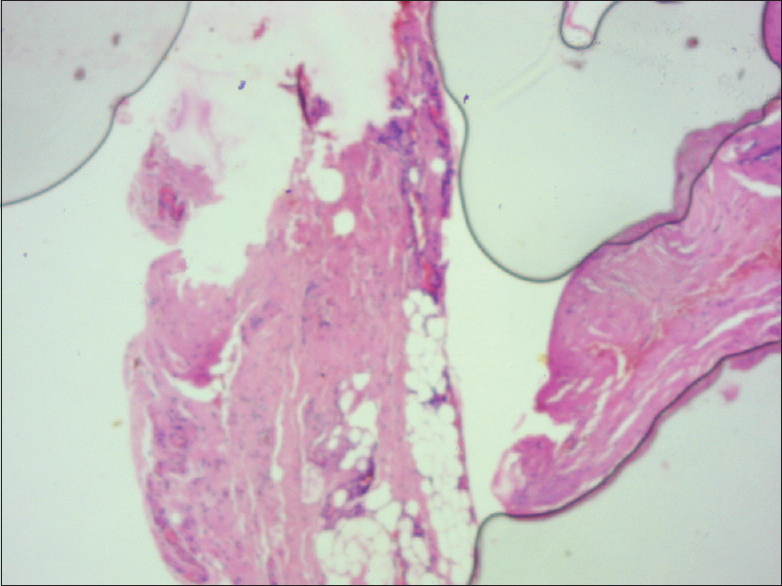 Some degree of fibrosis was present [Figure 6]. Postoperative period was uneventful, and IOP is being maintained at 12–14 mmHg with the vision of 6/6 N6 for about 8 months now. He has been on regular follow-up since then. Secondary glaucoma associated with iris and angle anomalies pose a challenge to treat and control the IOP, especially in young individuals. The chance of failure even after multiple modalities of treatment is high in such cases. The success of trabeculectomy depends on a functioning bleb. This process is influenced by wound-healing response, being more intense in the early postoperative period, but continues indefinitely after surgery and results in increasing failure rate over longer periods. In failed blebs, needling being a primary modality of treatment, we did subconjunctival needling with 5-FU. Our patient did not maintain IOP control despite these measures and subsequently underwent AGV surgery. It is well known that bleb encystment after AGV is a vexing problem and routine postoperative aqueous suppressants (topical and systemic) may be helpful in preventing bleb encystment. In this particular case, aqueous suppressants were used but did not seem to help. Hence, we performed Partial cyst wall excision in our case. Decapsulation and valve reimplantation procedures have been tried and found to be successful in some cases of encapsulated blebs. We are, however, not sure if the method we adopted to repair the bleb would be useful in all cases. Encysted bleb is one that is walled off by the Tenon's capsule and therefore is elevated and tense in appearance. Hagen Thieme et al. showed that 4 of 9 young patients developed encapsulated blebs after insertion of AGV though the cause could not be determined. The normal bulbar conjunctiva has (a) a three-layered epithelium of cylindrical, polyhedral and cuboidal cells with goblet cells and langerhans cells; (b) a lymphoid layer with loose connective tissue; and (c) a fibrous layer of collagen, vessels, and nerves. It is known that goblet cells are abundant in children and young adults. Normally, goblet cells are seen more in the palpebral layers than in the bulbar region. It is therefore possible that surgical procedures such as drainage device placements could cause increased proliferation of goblet cells leading to vacuolization resulting in the formation of an encysted bleb. The use of 5-FU and postoperative steroids could have also played a role in the fibrosis and absence of inflammation. However, further studies are necessary to determine the relationship between the morphology of the conjunctiva, bleb characteristics, and age of the patients undergoing such procedures so as to prevent failures and enhance the success of glaucoma procedures. Allingham RR. Shield's Textbook of Glaucoma. Management of Glaucoma. 5th ed. Lippincott Williams & Wilkins, Philadelphia 2004;p. 588-621. Vijaya L, Manish P, Ronnie G, Shantha B. Management of complications in glaucoma surgery. Indian J Ophthalmol 2011;59 Suppl:S131-40. Ewing RH, Stamper RL. Needle revision with and without 5-fluorouracil for the treatment of failed filtering blebs. Am J Ophthalmol 1990;110:254-9. Gedde SJ, Schiffman JC, Feuer WJ, Herndon LW, Brandt JD, Budenz DL, et al. Three-year follow-up of the tube versus trabeculectomy study. Am J Ophthalmol 2009;148:670-84. Costa VP, Correa MM, Kara-Jose N. Needling versus medical treatment in encapsulated blebs. A randomized, prospective study. Ophthalmology 1997;104:1215-20. Al-Mosallamy SM. 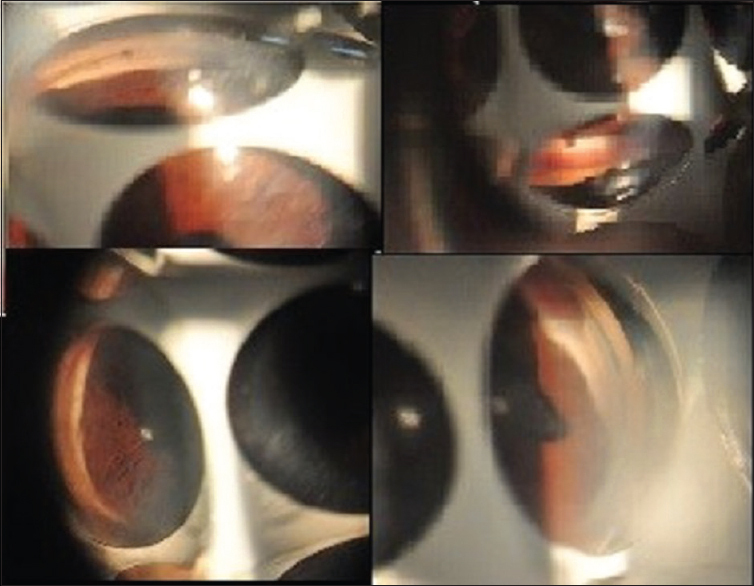 Decapsulation versus valve reimplantation in cases with an encysted Ahmed valve in refractory glaucoma. Delta J Ophthalmol 2015;16:22-6. Wells AP, Ashraff NN, Hall RC, et al. Comparison of two clinical bleb grading systems. Ophthalmology 2006;113:77-83. Thieme H, Choritz L, Hofmann-Rummelt C, Schloetzer-Schrehardt U, Kottler UB. Histopathologic findings in early encapsulated blebs of young patients treated with the Ahmed glaucoma valve. J Glaucoma 2011;20:246-51. Gordon K. Klintworth, Thomas J. Cummings. Head and neck: Normal eye and ocular adnexa. Histology for Pathologists. 3rd ed. Ch. 13. 2010: Lippincott Williams & Wilkins; Philadelphia.